Handmade Detroit | Yelp Helps for the Holidays! 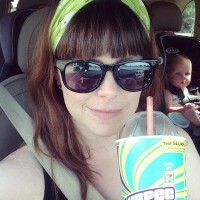 Yelp Helps for the Holidays! We are so glad that Yelp is a longtime sponsor of Detroit Urban Craft Fair, and that they are also a big supporter of Judson Center! If you aren’t familiar with them, Judson Center is a fantastic non-profit agency in Metro Detroit that provides services to assist those impacted by abuse and neglect, autism, developmental disabilities, and mental health challenges so they can be successful in their communities. 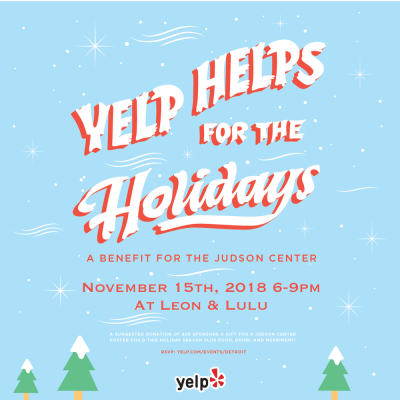 On Thursday, November 15th, Yelp is hosting the 5th Annual Yelp Helps for the Holidays in support of Judson Center and their mission. Last year this evening raised over $7000 to provide gifts to 250 children & this year you can help raise even more, while having a fun night out at the same time. Have a fun night out (all ages welcome) at Yelp Helps for the Holidays Thursday, November 15th 6-9pm at Leon & Lulu’s in Clawson! Check out more deets on their event page here.